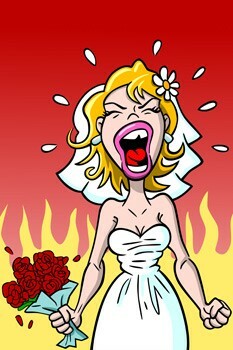 10 BIG Wedding Mistakes You MUST Avoid! You have spent all of your time planning out every aspect of the big day. But, did you cover all of your bases? A lot of brides have big wedding planning mistakes hiding in the corners — and these mistakes could unravel all of your tight planning. Luckily you can avoid a hiccup on your wedding day by avoiding these 10 big wedding mistakes. Your guest list determines a lot for your wedding — venue, the caterers, etc. While it might not be a fun part of wedding planning, sit down with your fiance and create a guest list. Get a firm count so that you can get accurate catering estimates and more importantly, reserve a venue that will fit all of your guests. Yes, wedding dresses are important. But, you have set aside funds for that dress for a reason. You need money for catering, flowers, venue and vendors. If you walk out of the bridal dress shop with a £10,000 dress, but only budgeted £2,000, you are going to have to cut other parts of the wedding — which might not be fun. You have had your heart set on a teal wedding only to realize teal is no longer cool a few months before the big day. Changing your colour palette too close to the wedding is just asking for issues. If you aren’t 100% positive about your colour choices, stick to classic black and white and pick an accent colour. Accent colours, versus a main colour, are a lot easier to swap out last minute. Yes, every bride wants to look her best on the wedding day — we get that. But, buying a wedding dress that isn’t fitting the real you today won’t help you in the future. It causes way too much stress — and could cost you thousands of pounds — to buy a dress that you will not fit in if you do not drop a few dress sizes by your last fitting. Pick a dress that fits today — rather than a dress you may fit into by the wedding day. Brides assume they can do it all on their own, but planning a wedding isn’t easy. Instead of trying to do it all solo, enlist the help of your bridesmaids or save yourself the hassle and hire a wedding planner (at least part-time). Yes, technically you could plan a wedding in two months, but if you have six months, why not use the full six months? Leaving stuff for last minute means you may not get the venue you wanted, may have to settle with a subpar supploer, etc. Give yourself ample time to plan the wedding and spread out your to-do’s so that the big items are done a few months before the big day. Whether it is a type of flower, colour or style of dress, being obsessed with a particular detail can throw off your entire wedding. Yes, you love tropical flowers, but you aren’t doing a tropical wedding theme. You’ll cause yourself more stress trying to incorporate those flowers than just going with something that does work. Everyone has a budget, but if you’re booking your suppliers based solely on their price and not their experience, you could wind up with a poor performance. Don’t sacrifice quality for price. There are plenty of quality suppliers out there that will work with you and your budget. Your mother-in-law wants roses, your dad wants you to play a special song, etc. Remember that it is your wedding — so you need to be happy with it. If you try to please everyone, you’ll go crazy.